Be aware of blind spots. Large commercial vehicles have huge blind spots, located around the front, back and sides of commercial vehicles. Do not drive in a blind spot. If you can’t see the driver in the truck’s side mirror, assume the driver can’t see you. When you pass a commercial vehicle, make sure that you are able to see the driver in the side mirror. Use your turn signal, then move into the left lane and accelerate rather than lingering in the blind spot. Before you pull in front of the truck, make sure it is visible in your rearview mirror. Don’t cut it close in front of a commercial vehicle. Not only are you likely to be in a blind spot that may prevent the driver from seeing you in time but, even if you are visible, the vehicle may not be able to slow quickly enough to avoid a crash. Generally, it takes a semi-truck 40% longer to stop than it takes an average car. Do not tailgate a large truck. 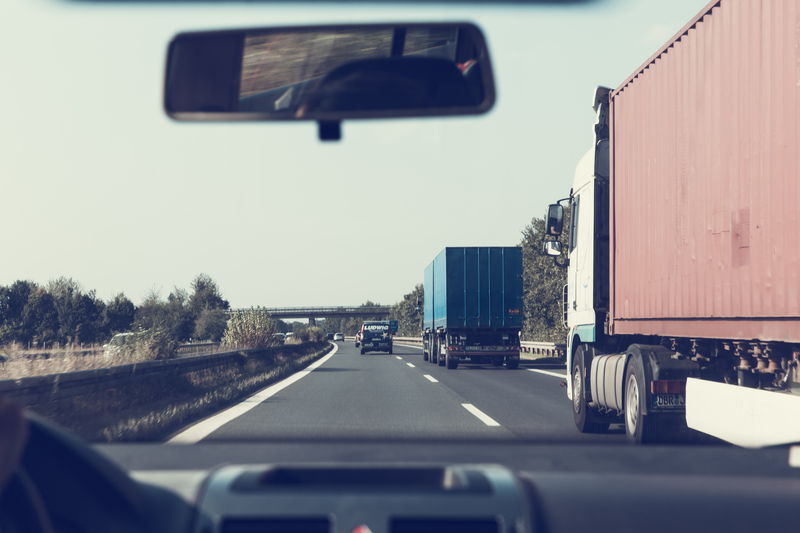 Not only does tailgating put you in the truck’s blind spot, but it could cause your vehicle to slide under the truck if the truck stops and you fail to stop in time or if you get hit from behind. Be aware that trucks make wide turns. If a truck has its turn signal on, do not try to squeeze by it or get between the vehicle and the curb. Be patient with large trucks. Trucks have operating restrictions such as speed limiters. If you honk, drive aggressively or weave through traffic, it could cause dangerous distractions and crashes. Stay focused so that you do not underestimate the speed or overestimate the distance of a truck, particularly when making turns, merging or changing lanes. In the handling of my accident and injury case, I found Mrs. Bass O'Neal both thorough and efficient in gaining a settlement that is very pleasing. - J.B.
Not only did Bass Law change my life but she also saved it. You gave me confidence through your integrity! - A.D.
Attorney Dondra was always easy to contact by phone or email. She reached out to update me on my case as much as possible. Thank you guys so much. I appreciate you and your firm's excellent service! - K.D. The whole process was pleasant and easy. She worked hard on our case and got us the most that we possibly could and what we deserved. - L.M. I would like to take this opportunity to extend my appreciation for your superior performance and hard work during my case. I highly recommend you to anyone who needs a good, professional attorney. Keep up the good work! - W.M. Excellent. Hate having legal problems but when and if I do, you're the one I'm gonna call! - A.B. I really appreciated the constant feedback with updates on my case. I also appreciated her acting on my behalf with my property claim as well. - M.J.
You were so very caring and made me feel confident that my case would be handled at your earliest convenience. You made me not be afraid to express myself, or worry about my transportation problems. You were my mouthpiece and treated me like a family friend. You took the stress and anxiety away because I was in a domestic violence shelter twice during my case. You were so professional along with whomever was helping at the time. It was a job "well done." Thanks a million! - B.R. This was the second case Bass Law has handled for me. I was very happy with the results in both cases. I would recommend them to anyone that needs legal help. - J.S. I found Ms. Bass to be very knowledgeable in motor vehicle accident claims and felt very comfortable due to her practicing in Florida and Georgia. - S.J. I think she is one of the excellent lawyers of this time and years of this decade and to come. - S.D. Dondra provided excellent, comprehensive legal assistance. In the courtroom, she was confident, competent and in control. More importantly, one on one, she was compassionate and understanding which made the whole process far less intimidating than it would have been. - L.C. Very positive woman! She kept me updated and in high spirits! She came through with all she said and got me the best outcome possible! I am very thankful and blessed for Mrs. O'Neal! - K.W.